I've been continuing to chew over the dilemma caused by the revelation that my Old Glory Fireflies are Sherman 1Cs. Brian sent me a useful treadheady link that indicates that in June 1944 there were exactly TWO (count 'em 2) Sherman ICs in 21st Army Group and they were in the Polish Division. And there were only 50 Sherman Is (with the 1st Tank Brigade). The Sherman I being out of production by late '43 there wouldn't be a lot being sent to Normandy as replacements. Most of the tank strength were Sherman Vs and VCs. I could use them for Italy, I suppose. Brian also wants to go halfsies on a bag of 17 pdr AT guns and crew when the boys head to Fall-In in November with our Hotlead club Old Glory Army Card. Turning the ICs into Grizzly Kangaroos to tow the 17 pdrs or carry some squaddies is looking better and better. I'm thinking a card set inside the hollow Old Glory hull and them some extra figures and stowage from my bits box to stand in the opening and more stowage would do the trick. So last week we're starting the new training year at cadets by having a bit of chinwag and giving them an opportunity to ask questions. I'm teaching the Silver Star (third year) cadets this year. "When do we get our VRIs?" Meaning their Royal Canadian Regiment cap badges. Our Cadet Corps is affiliated to the 4th battalion Royal Canadian Regiment and the senior cadets are allowed to wear the regimental badge instead of the maple leaf shaped RCAC cap badge that the first and second years wear. The regiment is allowed to wear Queen Victoria's cipher "VRI" on their cap badges still. So I ask them what it means. Someone says 'power' thinking of the status conferred. Who is our affiliated regiment? More blank stares, even though they have RCR shoulder flashes on their tunics. So I give them an impromptu seminar on the Canadian Forces, the Army, the Infantry and the RCR. Deciding they needed some visual aides and better regimental history than I could pull out of my head, I decided to make a quick lesson for them. Last night I arrived with a 40 minute power point on the RCR history. A quick gallop through 130 years and 6 wars but I hope they at least have some idea what it means to wear the VRI now. People keep bugging me to run a second convention in the fall. With the demise of MIGSCON and the cancellation of Council Fires there is no gaming convention in the fall in Southern Ontario. A few years back I set up a games day which we called Cold Steel. Invitation only; the Hotlead staff, gaming friends and Hotlead GMs for a day of games and food at our local Knights of Columbus Hall. Nice little venue, room for four tables and there's a kitchen and fridge for beer. The day went well and people keep asking me to run another one. Last year I was too busy with cadet stuff to find a date and this year I could have if I 'd started sooner. I suppose I could book another one next year. Too late really to plan anything for this fall. And my CO has suggested that a games day for the cadets might be a fun way to introduce some Canadian history to them. Earlier this year, the Assault Group had a nifty promotion; 'like' them on Facebook and pick a free mini from their catalogue. I like freebies and found a Russian Orthodox priest who I thought would be nifty to inspire my Napoleonic Russian army on the tabletop. 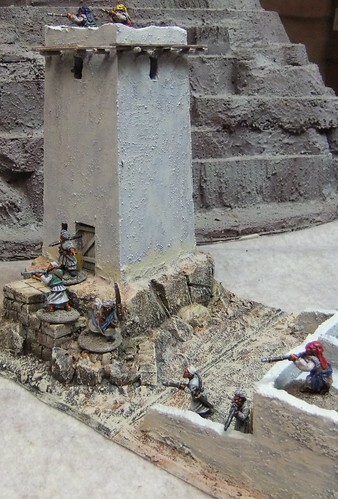 Of course I haven't gotten any Napoleonic Russian infantry painted yet! But the venerable cleric was easy to knock off while working on some Italian paratroopers for a customer. And of course, I've named him after my friend and Canadian Army chaplain the Mad Padre. 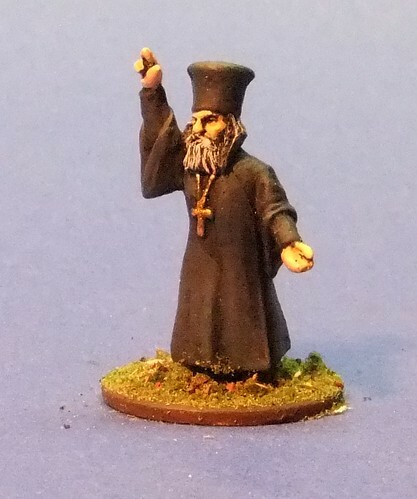 So here is Father Mikhail Petrovich, all set to bless my new recruits when they march out of the depot to defend Holy Mother Russia from the Corsican Antichrist! 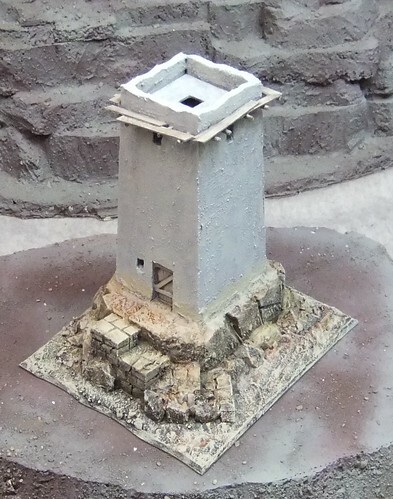 "Fort Blood" seems an appropriately cinematic name for my Pathan hill fort, since this build caused a trip to the Emergency Room for stitches and there are actually drops of blood beneath the paint when I nicked myself carving the rocky outcrop for the tower. ﻿﻿I liked the odd scaffoldy thing around the single tower so much I added it to the tower on the bigger fort too. I pre-drilled some holes and then glued in pieces of bamboo skewer. I then added planks made from cut up wooden coffee stirrers. 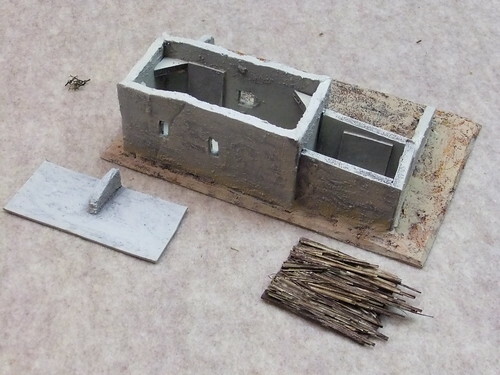 ﻿ I also decided to cut apart the single tower and it's outbuilding, making them two pieces and more flexible for layouts. 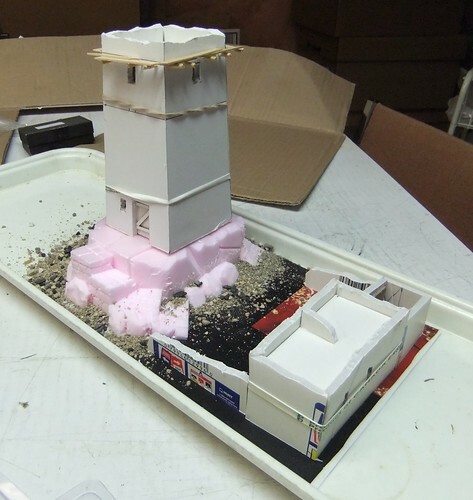 I decided that I may want a lone tower on a small hill, and the addition of the outbuilding could keep it from fitting. 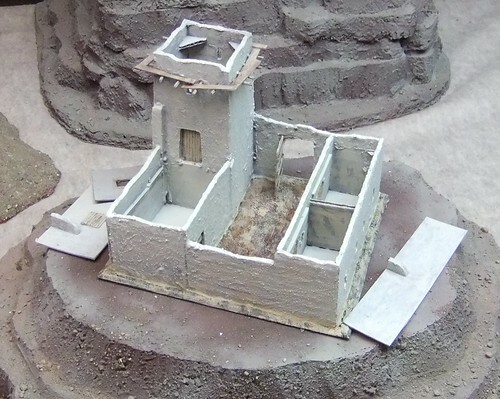 ﻿ I then gave everything a skim coat of a gritty textured grout, piling extra around the bases of the walls to smooth out the corners and make everything seem a bit more organic. I then set it aside for 24 hours to dry. The removable roof sections had to be trimmed down so they would fit again. The grout made the already snug fit too tight. ﻿ Next night I gave everything a coat of paint from my big pail of dark chocolate brown interior latex that I used to paint my NW Frontier hills and mountains and again set aside for 24 hours to dry. I then started dry brushing. A large, flat tipped regular paint brush is still too small and was resulting in a blotchy effect, which was unpleasing. I switched to a house painting brush wide enough to do the towers in one pass, but it held so much water in the bristles that it resulted in more of a wash that a dry brush. 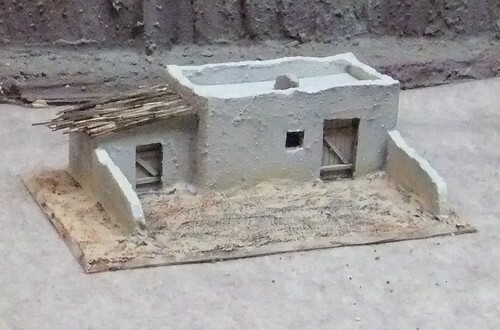 But I gave all pieces a thorough going over, using the smaller brush to get into corners and windows etc. The results were still pretty blotchy, so I went to Canadian Tire and used my accumulated Canadian Tire money to buy a can of Krylon Satin finish Almond and a can of Satin finish Ivory spray paints for highlighting. ﻿﻿The thatch roof on the storage shed gave some problems. A first attempt using a square of teddy bear fur resulted in a rounded roof that looked somewhat like a soggy square of shredded wheat. This was not quite what I was looking for. I originally tried a light grey dry brush on the wooden doors but this resulted in them being too washed out and disappearing into the walls, so I went over them again with khaki. The rocks and base also got too heavy a treatment from the spray paint, so I went over them again with brown ink and dry brushed khaki. I spent a bit of extra time with a big soft round brush and the khaki paint softening the hard edge the ink made along the bottom of the walls. Considering I've built these all out of scavenged material and off cuts and purchased the paints with Canadian Tire money, all three buildings are practically free! I've been wanting to make some North West Frontier hill forts for a long time now. Probably ever since I first started Colonial gaming. In the North West Frontier small tower houses and forts dotted the countryside like the border castles in Scotland. "Every house in this valley, and there are hundreds of them, is as I have described elsewhere, a little fortress. Each has thick strong walls, loopholes, and one or more lofty towers." (The Campaign in Tirah 1897-1898, Col. H.D. Hutchinson, p.79) Capturing them to clear a pass or blowing them up to punish a wayward clan chief was the objective of many an Imperial column from the 1850s until Independence and Partition in 1947. 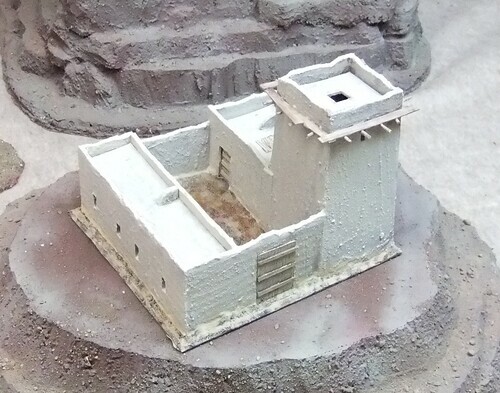 So I've been perusing the internet and pouring over pictures on blogs of the lovely hill forts made by Chris the Model maker. How do you make them 'hill forty' and Afghan and not look too western like Fort Zinderneuf? I planned, and sketched and pondered. And planned some more and put it off. Plus it's a lot of cutting and gluing and takes up space. My work bench is also my gaming table, so having to clear things off to make some room puts me off too. But every time I have a game I'm forced to clear my table off which gives me a chance to pause and rethink my projects too. A cleared off table after a game is like a blank canvas and I get inspired to bash on with the next thing on my list of projects. A month or two back I started on a British fort. I was going to experiment with something other than foam core (I only had one sheet and didn't want to go buy more if I could avoid it). 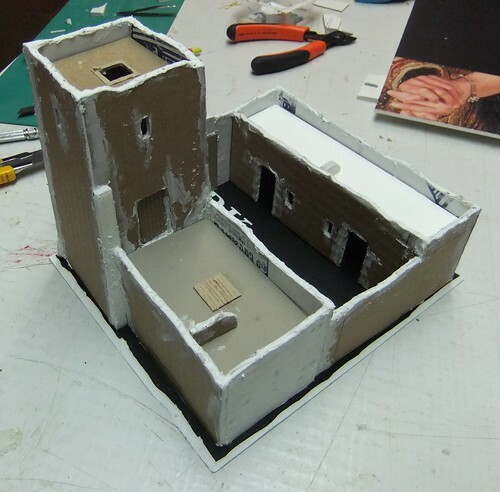 I had some nice fibre board which had a brick like texture on one side which I thought could work for me. I was also going to try cutting the towers out of this thick plastic board used by the local theater festival for posters. Cutting out the narrow firing slits was problematic. Then disaster struck, the knife slipped and I was finding out how nice our new Emergency Ward is. This weekend though, I am enjoying my FIRST long weekend of the summer. So yesterday, while Mrs. Rabbitman was reading a book and recovering from our taking Daughter No.2 up to University, I cleared up from last week's game and inspired by the blank table, said "Damn it! I AM building a hill fort!" I figured to get the ramshackle, organic Afghan look I didn't measure very precisely which resulted in some odd angles and a few gaps that had to be covered over or filled in. 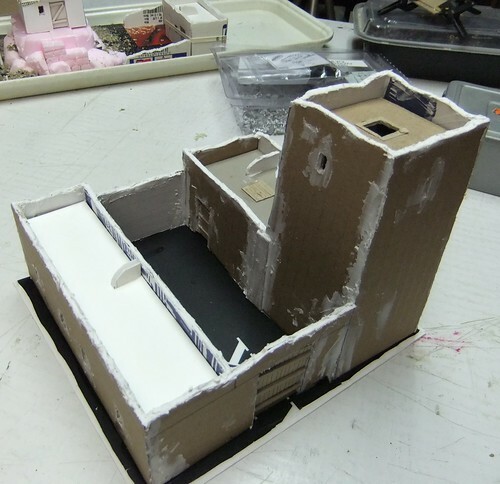 The roof on the tower lifts off so riflemen can fire from the loopholes and the roofs on each building also lift off. The long building is divided into two rooms. I figure the British might need to search for a captive or something, so adding some rooms was a good idea. The downside to corrugated cardboard is all the holes which had to be filled with caulking. 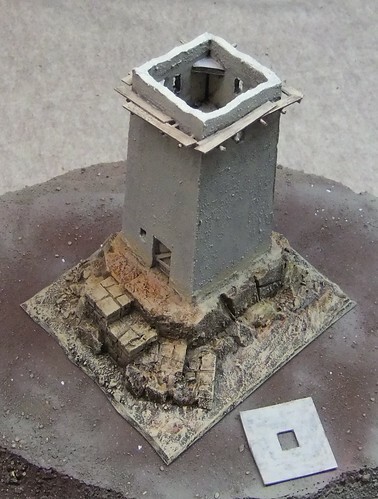 The tower isn't glued down yet, I still need to fill the gaps in the rocky outcrop I made from my box of off cuts. Once again the tower roof comes off to give access to the upper floor. The roofs on the outbuildings also come off. With the first fort I started with the tower and added to it and finally cut a base (from that thick plastic poster board) to fit. With the second tower I cut the base, built the rocky outcrop and then fit everything else to it. I wanted a smaller more 'cozy' feel to this one. It's the home of a smaller chief. The first fort is obviously for a much bigger fellow in the neighbourhood, and it can hold a unit of 20 or so tribesmen.